OAKLAND – You might have heard that the San Francisco Giants have been enduring a bit of a power outage over the past few years. The Giants finished dead last in team home runs in 2017, and followed up that performance in 2018 by moving up one spot on the rankings to 29th. You might have also heard that the Giants recently met with free agent outfielder Bryce Harper to help with their power problem. Today it was reported that the Giants plan to offer the 26-year-old a lucrative, short-term contract in the near future. 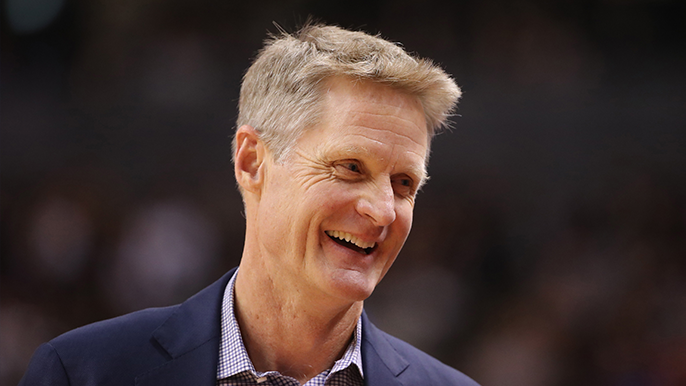 Before Sunday night’s game against the Miami Heat, Warriors coach Steve Kerr was asked about the prospect of the Giants signing the 2015 NL MVP. Well, that should do it. No doubt Harper was sitting at home waiting for Kerr to weigh in on the situation. Either that or he’ll make the decision based on what’s best for him and his family. Only time will tell. Either way, it’s good to see Kerr trying to help out his future San Francisco neighbors reel in the big fish.